This was most certainly not the Saints side supporters have come to know and love during the past couple of seasons. In fact, at the AJ Bell Stadium on Saturday, Jim Mallinder’s men were almost unrecognisable from the team that had won 15 of their previous 18 games in the current campaign. Firstly, it is only fair to point out that this was an unfamilar performance from an unfamiliar pack. Sam Dickinson and Calum Clark, both of whom were carded on an afternoon of yellow peril, were makeshift locks. Ben Nutley, who had not started since the win at London Welsh at the end of November, was thrown in on the flank. And Saints were desperately lacking the brute force offered by ‘Bruise Brothers’ Courtney Lawes and Samu Manoa, along with the ever-cool head of Christian Day. On the kind of day windmills were designed for, Saints needed those men to rule the skies. Instead, they were caught short in the set piece, with the creaking lineout a constant source of frustration. And Sale, rested and refreshed after eight changes were made to the team which was walloped at Wasps on the previous weekend, took full advantage. The home side produced a performance so dominant that you thought the teams had entered the wrong dressing rooms, donning the opposition’s kit before the game. But, no, Sale really were the team in blue and white and, more shockingly, the current champions really were the men in lime. The Sharks drowned Saints during a first half display that beggared belief. Mallinder’s men spent what must have been close to 35 minutes penned in their own half, playing against the wind and a home team determined to defend their territory. 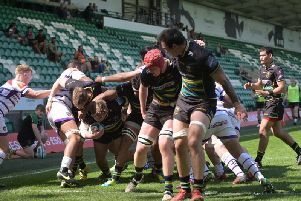 It was a deluge of pressure, much like Saints have subjected sides to at Franklin’s Gardens this season. But this time they were on the other end of it. And this time, unlike a couple of weeks ago at Twickenham, when they beat Harlequins with around 25 per cent possession, they were punished. There is a feeling this has been coming. That Saints had been riding their luck during the latter part of a seven-match winning streak. The coaches and players admitted that their defending had to be better if they were to survive at the AJ Bell Stadium. And although it was, marginally, the sheer weight of pressure put on them ensured Sale would eventually break through. A 13-0 half-time lead was added to in the second half before Teimana Harrison wrestled his way over to grab a consolation score for a Saints side struggling to see the positives. Quite simply, this was one of those days you write off as quickly as possible. You allow it to motivate you for the following weekend, but dwelling on it would be dangerous. Saints know they have more stern tests to come: crucial Champions Cup clashes lie in wait on successive weekends. Just as it was last March, defeat at Sale must be a salutary experience. On that occasion, Saints were described as ‘knackered’ by Sale boss Steve Diamond and said to lack cohesion by Mallinder. But they bounced back and went on to win two trophies. Now they will be desperate to use the Sharks shock as a catalyst once more. Losing is an unfamiliar experience for Saints. And they will want to make sure it stays that way in the coming weeks.